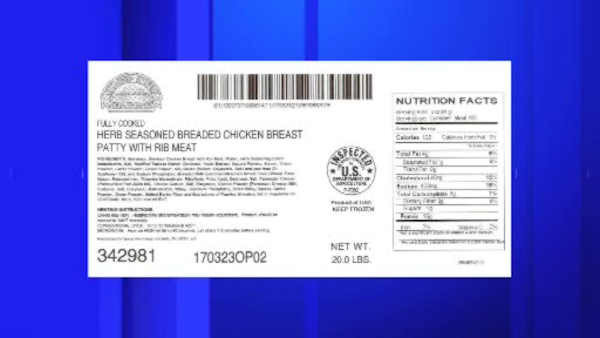 OKLAHOMA CITY, Oklahoma -- An Oklahoma food company is recalling more than 466 tons (422 metric tons) of breaded chicken because of possible metal in the food. The U.S. Department of Agriculture said Friday that OK Food, Inc. is recalling 933,272 (423,329 kilograms) pounds of the food shipped nationwide that was produced between Dec. 19, 2016, and March 7, 2017, and includes the number "P-7092" inside the USDA inspection mark. The USDA said in a news release that contamination came from metal conveyor belts and was discovered Tuesday. An agency spokesman did not immediately return a phone call for further comment. The agency says there have been no confirmed reports of injury, but consumers should either throw the product away or return it to the place of purchase.